Small amounts of oil leave a fluorescent sheen on polluted water. Oil sheen is hard to remove, even when the water is aerated with ozone or filtered through sand. Now, a University of Utah engineer has developed an inexpensive new method to remove oil sheen by repeatedly pressurizing and depressurizing ozone gas, creating microscopic bubbles that attack the oil so it can be removed by sand filters. •So-called "produced water" from oil and gas drilling sites on land. Such oily water normally is re-injected underground. "If we have technology to clean it, it could be put into beneficial uses, such as irrigation, especially in arid regions where oil and gas tend to be produced," says Hong. •Water from mining of tar sands and oil shale. •Groundwater contaminated by MTBE, a gasoline additive that reduces harmful vehicle emissions but pollutes water due to leaking underground gasoline storage tanks. •"Emerging contaminants," such as wastewater polluted with medications and personal care products. •Soil contaminated with polychlorinated biphenyls (PCBs, from electrical transformers) or polycyclic aromatic hydrocarbons (PAHs, from fuel burning). Water and contaminated soil would be mixed into slurry, and then treated with the new method. •Heavy metals in soil. Instead of ozone, air and metal-grabbing chelating agents would be pressurized with a slurry of the contaminated material. •Refinery wastewater and oil spills at refineries or on waterways. The spill could be vacuumed, and then treated with the new method on-site or on a barge. Hong conducted the study with two University of Utah doctoral students - Zhixiong Cha, who has earned his Ph.D., and Chia-Jung Cheng - and with Cheng-Fang Lin, an environmental engineering professor at National Taiwan University. Hong says his method uses two existing technologies - ozone aeration and sand filtration - and adds a big change to the former. Instead of just bubbling ozone through polluted water, Hong uses repeated cycles of pressurization of ozone and dirty water so the ozone saturates the water, followed by depressurization so the ozone expands into numerous microbubbles in the polluted water, similar to the way a carbonated beverage foams and overflows if opened quickly. The tiny bubbles provide much more surface area - compared with larger bubbles from normal ozone aeration - for the oxygen in ozone to react chemically with oil. 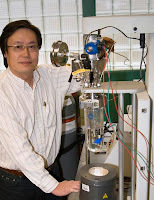 Hong says pollutants tend to accumulate on the bubbles because they are not very water-soluble. The ozone in the bubble attacks certain pollutants because it is a strong oxidant. The reactions convert most of the dispersed oil droplets - which float on water to cause sheen - into acids and chemicals known as aldehydes and ketones. Most of those substances, in turn, help the remaining oil droplets clump together so they can be removed by conventional sand filtration, he adds. He found that his most effective procedure removed 99 percent of the turbidity from the "produced water" - leaving it almost as clear as drinking water - and removed 83 percent of the oil, converting the rest to dissolved organic acids removable by biodegradation.